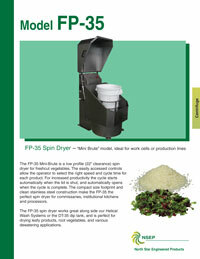 The FP-35 Mini-Brute is a low profile (22” clearance) spin dryer for fresh-cut vegetables. The easily accessed controls allow the operator to select the right speed and cycle time for each product. For increased productivity the cycle starts automatically when the lid is shut, and automatically opens when the cycle is complete. The compact size footprint and clean stainless steel construction make the FP-35 the perfect spin dryer for commissaries, institutional kitchens and processors. Auto-open lid when cycle completes. 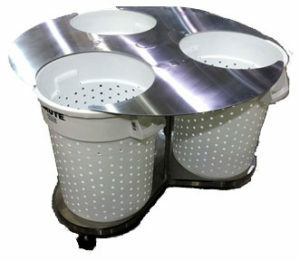 The basket carousel is designed to facilitate loading of de-watered and washed produce from the Helical Wash Systems. Empty baskets are positioned in the basket carousel and the operator rotates the empty basket under the discharge of the Helical Washer. After it is filled, the next basket can be easily rotated in place. 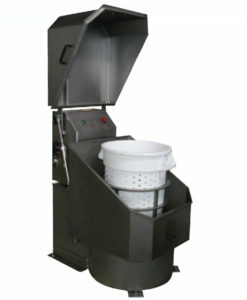 The full basket can then be transferred to the FP35 Spin Dryer.